This analysis was produced as part of the Naval Academy Foreign Affairs Conference, held in April of 2017. Since that time, Montenegro has officially joined NATO. Consequently, the international system is now witnessing the single most important moment in NATO’s history since the collective response to the 9/11 attacks. It is clear that continued sanctions in the vein of visa bans and asset freezes are no longer adequate responses to Putin’s actions. In order to stave off further illegal expansion by an emboldened Russia, NATO must swiftly expand to include Finland and Sweden. Deciding not to expand NATO to include these Nordic States would represent a complete failure to learn the lessons of the last decade, which occurred as a result of the rejection of Ukraine and Georgia’s attempts to join NATO. This proposed 7th expansion of NATO would include Montenegró, which has recently earned acceptance from Alliance member states.3 There is no better way to contain Russia than through expanding the alliance, the most effective collective defense organization in history and the historical counterbalance to Russo-Soviet expansionism. Prior to and throughout the invasions of Georgia (2008) and Ukraine (2014), Russia telegraphed its intention to regain its former status as a great power. After the dissolution of the Soviet Union, the Russian military fell from around 5 million troops to roughly 1 million in 19944 and the capacity of those 1 million troops to exert Russian influence was questionable. Since that time, Russia’s military strength has experienced a revitalization, bringing the current number to over 3 million troops.5 The Russian military budget has increased by a factor of 5 since 1994, with a 91 percent boost in spending from 2006 to 2016.6 This boost in military spending and size transformed the Russian Armed Forces from a fledgling that could only muster around 60,000 troops to put down a Chechen rebellion in 19947 to its current status as a resurgent world superpower that successfully used covert military forces to annex an entire region of its sovereign neighbor Ukraine in 2014. Through his reforms following the 2008 invasion of Georgia, Vladimir Putin has orchestrated a spectacular comeback for Russia in a region where the nation lost almost all of its influence a quarter century ago. The question of why Georgia and Ukraine were targeted specifically is answered by the failure of NATO to offer either nation a Membership Action Plan following the April 2008 Bucharest Summit despite the pursuit of admission to the Alliance by both states.8 It is likely that Putin was greatly relieved by this shortsighted decision by NATO, as his plans for Russian expansion were no longer threatened by NATO’s collective defense pledge. 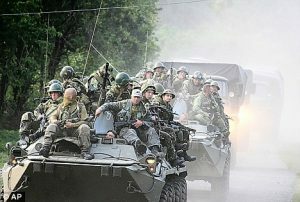 It only took four months for Russia to invade the former NATO-hopeful Georgia, in what is referred to as the first European war of the 21st Century.9 There is a reason the invocation of NATO’s collective defense measure, otherwise known as Article 5, has only occurred once in history, and that it was prompted by the actions of rogue non-state actors on 9/11. The full backing of NATO’s member states maintains peace at a level unseen in history by guaranteeing a costly counterattack to actions like the invasions of Georgia and Ukraine. It is critical for NATO to learn from the mistakes of the Bucharest Summit and prevent further destabilization of Europe by accepting both Finland and Sweden into the Alliance posthaste. The United States and NATO have been operating without a grand strategy since the fall of the Soviet Union, and consequently, Russia has implemented its own grand strategy that takes advantage of this stunning lack of action by the West. Russia is clearly, though not officially, following the grand strategy laid out in the Foundations of Geopolitics by Alexandre Dugin. The book has had a considerable impact on Russian foreign policy and was adopted as an official textbook at the Russian equivalent of the U.S. Naval War College, where senior officers and government officials receive graduate degrees related to policy.10 Major points of the work include (among other goals) separating England from Europe, dismantling Georgia, and annexing Crimea,11 all of which have been at least partially accomplished through Russian pressure, overt or otherwise. Not only have the arguments laid out in Dugin’s work been mirrored by Russian policy, but Dugin has even been made a major foreign policy advisor to the Putin regime12 and enjoys considerable influence and contact with the parliament and military.13 One major goal listed in the plan that has yet to be accomplished is the annexation of Finland. This, along with continued aggressive actions against Finland, shows that there is an imminent threat to Finland from Russia. If Finland fails to act quickly to join NATO, it is likely to be next in line for Russian expansion, in partial fulfillment of Dugin’s grand strategy for resurgent Russia. 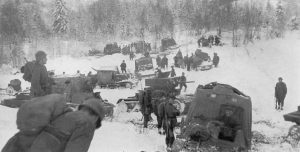 Russian T-26 light tanks and T-20 Komsomolets armored tractors advancing into Finland during the Winter War, 2 Dec 1939. In both Finland and Sweden, support for accession to NATO has been growing due to the aftermath of the annexation of Crimea. Russia has significantly ramped up operations and drills in the vicinity of Finland to such a degree that both Finland and Sweden are actively seeking new defensive agreements with western nations including the U.K. and U.S.14 Multiple Russian jets have violated Finnish airspace, further showing Russia’s disregard for the sovereignty of any of its neighbors.15 Additionally, Russia has been working to increase Finland’s dependency in order to further pull it into Russia’s economic and political sphere of influence. One such attempt involves energy, where Russia is attempting to undermine the Finnish energy sector and even create an artificial energy crisis which would drive Finland to rely heavily on Russian government and energy firms.16 Like Georgia and Ukraine, Finland was once part of Russia, and such historical ties were used as justification for both of Putin’s illegal invasions.17 18 In fact, the Winter War of 1939 was started by Russia in an attempt to reabsorb Finland; it resulted in Russian territorial gains from Eastern Finland.19 Based on the recent Russian actions in Georgia and Ukraine, it is not outside of the realm of possibility for Russia to make another attempt to regain Finland. Sweden has felt the increased pressure from Russia as well, as evidenced by the extreme step the Civil Contingency Agency of Sweden took in December 2016 of telling towns to reinitiate Cold War era counter-invasion measures, including bunker systems and military drills.20 All of this represents a return to the great power conflict of the Cold War. Additionally, this demonstrates the clear and present threat to both Finland and Sweden from Russia that NATO would best solve. Convincing the people of Finland of the necessity of NATO membership appears to be reliant on Sweden agreeing to join simultaneously. Support for a military alliance with Sweden is high, with 54 percent of Finns supporting such an alliance in 2014 while only 36 percent oppose21, so the people of Finland could be persuaded to support NATO if their friend Sweden agrees to join as well. That same year, Gallup found that 53 percent of Finnish citizens would support joining NATO if the government of Finland recommended the move.22 Since Finland already recognizes the importance of a military alliance with Sweden, it clearly can be convinced of the necessity of NATO as well. In Sweden, support of NATO membership has been on the rise. For instance, in 2015 the Centre Right Party joined two other major Swedish political parties to support NATO membership after having previously opposed the measure,23 which further indicates the political tides of the nation are turning in support of NATO. Not only is the move towards membership a necessity for these two nations, but it is also entirely within the realm of possibility in the near future. Both Finland and Sweden have been longtime members of the Partnership for Peace (PfP)24, a NATO program which aims to build stronger relationships with non-Alliance members.25 Participation in the PfP is often seen as a pathway to membership since so many current NATO members were originally part of the PfP. This is crucial, because under Article 10 of the treaty all members must be unanimously confirmed; the fact that Finland and Sweden are already contributing to the collective defense of NATO shows that they would be valuable assets to the Alliance. Both Finland and Sweden sent troops to support NATO actions in Afghanistan, and Sweden was part of NATO’s 2011 mission in Libya.26 Due to their willingness to participate in operations, Finland and Sweden are clearly military assets to NATO, thus clearing the collective defense hurdle of NATO. Despite this, neither nation could take on Russia alone. Swedish military experts found that if attacked by Russia, the nation could only hold out for one week27, further highlighting the need for NATO to step in and prevent another Crimean crisis. Opponents of NATO enlargement may argue that Sweden and Finland fail to meet the requisite military spending requirement of the Alliance, which is 2 percent of GDP. This is irrelevant for two reasons. First, it is far more important to keep Russia in check and have nations remain in America/NATO’s sphere of influence than to worry about the arbitrary 2 percent requirement. Demanding Sweden and Finland to increase their spending before joining will not create any measurable increase in NATO’s military effectiveness, as the U.S. spends around $650 billion dollars on defense.28 The next closest Alliance member spends a mere 60 billion dollars.29 It could be reasonable to require that both nations set a goal of reaching the 2 percent threshold within a decade, but the situation in Europe is too precarious to hesitate on such a minor issue. The true goal of NATO is maintaining the post-Soviet world order through the maintenance of the current spheres of influence. The second reason the 2 percent requirement is irrelevant is the fact that only 5 of the 28 members currently meet the requirement. Based on publicly available military budget information, of the 28 NATO members, Finland outspends 14 before even joining and Sweden outspends Finland as well. Allowing Russia to continue to destabilize all of Europe because Finland and Sweden fail to meet a standard that over 80 percent of current NATO members also fail to meet is shortsighted. There is a choice for NATO currently: either allow Russia to expand its sphere of influence even beyond the bounds of the former USSR into the Nordic States, or learn from the examples of Georgia and Ukraine by blocking expansionism through a 7th enlargement of the Alliance. 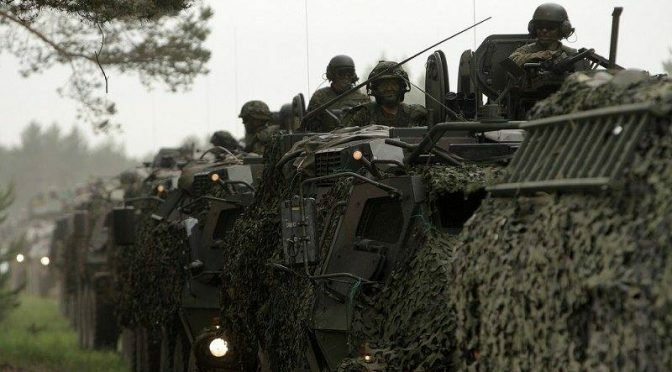 We are clearly in a new era of great power conflict, and for their own safety Sweden and Finland must join their Nordic neighbors under the collective defense shield of NATO. NATO must recognize the dawn of this new era and learn the lessons of Crimea. The move to add Finland and Sweden to NATO is not only plausible, but entirely necessary to safeguard the stability and peace that Europe has enjoyed since the fall of the USSR. Midshipman Kirk Wolff is from Morristown, Tennessee and is studying political science as a member of the U.S. Naval Academy Class of 2018. He can be contacted at wkirkwolff@gmail.com. The author would like to thank Dr. Gale Mattox at USNA for her help. Organization for Security and Co-operation in Europe (OSCE). Budapest Memorandums on Security Assurances. 1994. Ellen Barry and Steven Myers. “Putin Reclaims Crimea for Russia and Bitterly Denounces the West.” New York Times, March 18, 2014. Edward Joseph and Siniša Vuković. “Montenegro’s NATO Bid.” Foreign Affairs, December 22, 2016. Dmtri Trenin,. “The Revival of the Russian Bear.” Foreign Affairs, May & June 2016. “Russian Military Strength.” Global Firepower. 2016. Sam Perlo-Freeman, Aude Fleurant, Pieter Wezeman, and Siemon Wezeman. “Trends in World Military Expenditure, 2015.” SIPRI Fact Sheet- Stockholm International Peace Research Institute, 2016, 4. Adam Taylor. “That time Ukraine tried to join NATO — and NATO said no.” Washington Post, September 4, 2014. John Dunlop. “Aleksandr Dugin’s Foundations of Geopolitics.” Demokratizatsiya: The Journal of Post-Soviet Democratization, no. 41 (January 31, 2004): 1. Henry Meyer and Onur Ant. “The One Russian Linking Putin, Erdogan and Trump.” Bloomberg, February 2, 2017. Dunlop. Aleksandr Dugin’s Foundations of Geopolitics. 12. Julian Borger. “Finland says it is nearing security deal with US amid concerns over Russia.” The Guardian, August 22, 2016. Tuomas Forsell and Jussi Rosendahl. “Estonia, Finland say Russia entered airspace before U.S. defense pact.” Reuters. October 7, 2016. Rebecca Flood. “Finland warns Russia is becoming ‘more aggressive’ with nuclear power threat.” The Express UK, September 1, 2016. “Russia moves toward open annexation of Abkhazi, South Ossetia.” Eurasia Daily Monitor 5, no. 74. April 18, 2008. “The Soviet-Finnish War, 1939-1940.” Military Review, July 1941, 1-16. “Swedish towns told to ‘make preparations regarding the threat of war and conflict’ with Russia.” The Telegraph, December 15, 2016. “Majority of Finns back Swedish military union.” The Local. March 24, 2014. Verkkouutiset explained: The people willing to join NATO, if the state leadership so wishes.” Verkkouutiset. March 25, 2014. “Swedish centre right in favour of NATO membership.” Reuters. October 9, 2015. “Signatures of Partnership for Peace Framework Document.” NATO. January 10, 2012. “Partnership for Peace programme.” NATO. April 7, 2016. Gabriela Baczynska. “Wary of Russia, Sweden and Finland sit at NATO top table.” Reuters. July 8, 2016. Suvi Turtiainen. “Sweden and Finland Face Their Russian Fears.” Die Welt (The World, German). April 9, 2014. Ivanna Kottasova. “These NATO countries are not spending their fair share on defense.” CNN.com. July 8, 2016. “Just Visiting: Russian aggression is pushing Finland and Sweden towards NATO.” The Economist, July 7, 2016. Previous PostDavy Jones Isn’t Done with Us YetNext PostIs Collective Southeast Asian Security Only Achievable in Malacca?